LTHForum.com - David Burke's Primehouse - Yowsa! David Burke's Primehouse - Yowsa! 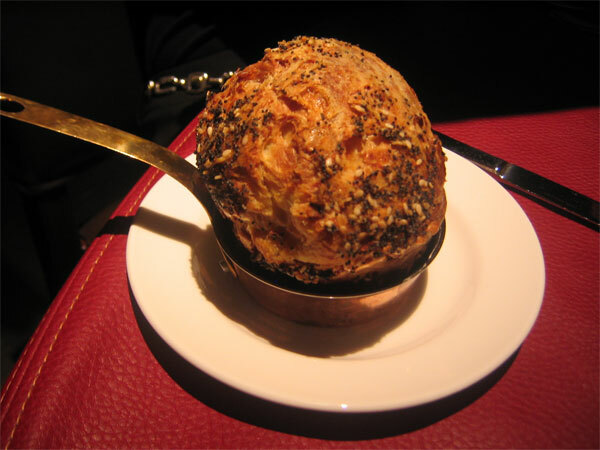 LTH Home > Chat > Eating Out in Chicagoland > David Burke's Primehouse - Yowsa! The last time I decided to try the newest steakhouse in town, I made a trip to the recently opened Custom House for a heaping helping of mediocre food and sub-standard service. You would think I would have learned my lesson, but NO…I’m a glutton for punishment. So last night I found myself at the newly opened David Burke’s Primehouse in the also newly opened James Hotel (in the space that was formerly occupied by the Lennox House Coffee Shop and a Houston’s). Boy, am I glad I got back on the horse. Although being open a mere 3 days, this place was hitting on all cylinders. Our party of 4 (GWiv, MsWiv, The Chow Poodle and I) was treated to one of the best steakhouse meals I have had in recent memory. 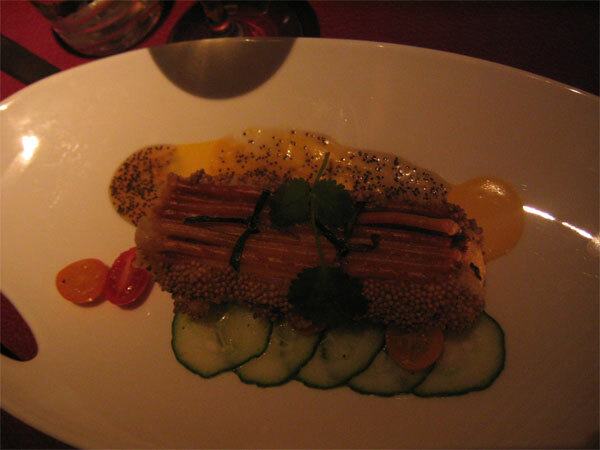 •	Crab Cake, a unique version of this dish that was wrapped with chives and crusted with German pretzels then beautifully plated with mango and honey mustard seed sauces. 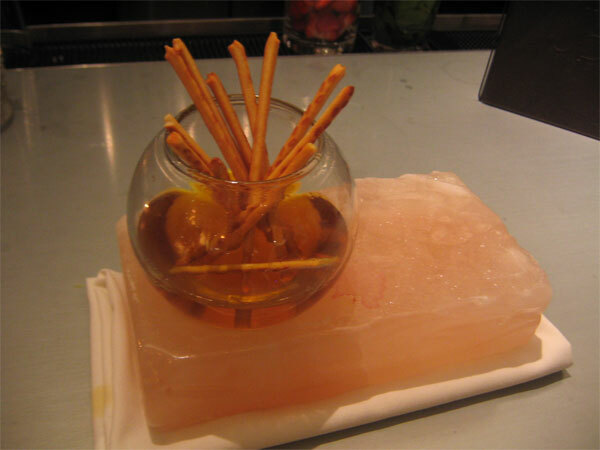 This dish was the star of the appetizer show and was conceived, according to Chef Burke, at a bar while indulging in beer and pretzels. (Although none of the other appetizers were slouches, either). Primehouse offers a classic, prepared tableside (in our case by Chef Burke himself) Caesar’s Salad. This was the real deal. I don’t know about you, but it’s been years since I have had an actual real, prepared from scratch, using real raw eggs and anchovies, Caesar Salad. No bottled dressing here, this was beautifully prepared in the old school manner using fresh ingredients. We opted for the optional crab cake croutons which seemed out of place in this faithful rendition of the classic recipe. I recommend skipping this indulgence when ordering this salad…and if you go here for dinner DO order this salad. Primehouse’s claim to fame is prime beef that is dry aged in their own “salt caves” located in the basement of the hotel. Chef Burke told us that they did extensive research on the effects of different environments on the taste of dry aged meat and had settled on using salt in the dry aging process. They have a “wall of salt” installed in their dry ageing cooler and age their meat a minimum of 28 days (except in the case of filets, which they age considerably shorter due to the lack of fat content in the meat). He went on to say that since the restaurant is so new, they are still experimenting with the actual aging process and that the steaks they are serving now are actually the first batch to come out of the “salt cave”. That is understandable, since the restaurant has only been open for 3 days. As a little added “story”, it turns out that the restaurant owns its own bull, named “Prime 207L”. Evidently, all of the beef served at the restaurant is sired by this bull at Creekstone Farm in Kentucky. Judging by the fantastic bone in rib eye that I had, they know what they are doing. This was one of the most flavorful steaks that I have had in quite some time. The Chow Poodle had a filet that was also quite good and Ms. Wiv had a larger bone in version of the filet that looked astronomical. If there is any downside to this place, it’s the side dishes. We had creamed spinach which was serviceable, but paled in comparison to the versions served at Smith & Wollensky or Lawry’s, hash browns that were greasy and salty, tempura fried green beans that were actually pretty good, and house made onion rings that were nothing special. Both of the deep fried items tasted faintly of curry, which we were told comes from special curry scented oil that is used for the deep fried items. I’m still undecided as to whether I liked the curry notes or not. Deserts consisted of about 10 different choices. We opted for a cheesecake lollipop tree because how often can you say you had one of those, and a trio of house made ice creams and sorbets. I’m not the biggest cheesecake fan, so I won’t comment other than to say is was a beautiful presentation and the accompanying raspberries were very good. The ice creams were outstanding…especially the deep chocolate ice cream and melon sorbet. All in all, this was a fantastic meal. I’ll be back as often as my wallet allows. This place isn’t cheap. Granted, we ordered an excessive amount of food in true LTH style, but dinner for 4, with a couple bottles of wine and tip came in at a whopping $600…even after a surprise 20% discount that they are giving everyone during the first couple of weeks of operation as they work out the kinks (which were so minor as to be nearly unnoticeable). For an outstanding steakhouse experience, Primehouse is the anti-Custom House and shouldn’t be missed. It has instantly become my new favorite steakhouse in town, displacing both Smith & Wollensky and Gene & Georgetti's. Is Custom House a steak hosue? I thought it was a meat restaurant. Can't get quail at steak houses as far as I know.... And I liked the place, but wasn't expecting a steak house. Otherwise, thanks for the comments. Well, Steve Z isn't the only one to consider Custom House primarily a steak house, or at least a restaurant with a heavy emphasis on steak, to judge by a quick perusal of both Reader and Tribune reviews online. Digressions as to whether Custom House is a steak house or artisanal meat restaurant aside I've been twice and was mildly disappointed each time. Actually, to be fair, more than mildly on the first visit. David Burke's Primehouse, on the other hand, was terrific in every and all regards. Steve summed it up nicely when he dubbed Primehouse the "anti-Custom House"
Primehouse is now my Chicago steakhouse of choice. Last edited by G Wiv on March 25th, 2006, 11:02 pm, edited 1 time in total. On a related note, I was at Gioco recently and split the 40oz "bistecca alla Fiorentina." While most of the food was sort of hit or miss, the steak was one of the best I can remember. It is broiled over white-hot oak logs that are just a few inches from the cooking surface. Lot's of good steaks these days. The Smith & Wollensky chain also deserves some credit for pioneering the not-just-steak house. Really? I don't doubt that you're more familiar with the menu of it and its competitors than me, but offhand S&W seems to fetishize beef (and manly accompaniments such as jeroboams of Bordeaux and baked potatoes the size of John Malkovich's head) and fill out the menu with a few obligatory fish and such for the ladies in no different a way than steak houses have done since the beginning of time. Keefer's seemed to be presenting a genuinely new, commercially canny, half-steak-and-half-cuisine approach, S&W has always seemed safely within the 80/20 beef/other stuff ratio long typical at such places. When S&W first franchised, they had more quality "restaurant dishes" than just about any steak place. Mostly stuff from Park Ave. Cafe etc. The crackling pork shank for example. That was Burke too, no? Anyway, nowadays I agree that it does not seem so innovative. But I do remember thinking it was fresh at the time, when maybe a lobster or some whitefish was all you'd see apart from red meat. In any event, I can't bring myself to order anything but steak at a steak house. But some nice grilled sardines make a fine entree to the meal. JeffB wrote: When S&W first franchised, they had more quality "restaurant dishes" than just about any steak place. Mostly stuff from Park Ave. Cafe etc. The crackling pork shank for example. That was Burke too, no? Anyway, nowadays I agree that it does not seem so innovative. But I do remember thinking it was fresh at the time, when maybe a lobster or some whitefish was all you'd see apart from red meat. In any event, I can't bring myself to order anything but steak at a steak house. But some nice grilled sardines make a fine entree to the meal. There were a number of non-steak items on the menu at Primehouseas well. In fact, there are more non-steak items than there are steak items including the above mentioned pork shank. Does this make Primehouse not a Steakhouse, but a "meat restaurant"? Anyone who wishes can fight over the semantics, but it would be a wasted trip to order anything other than a steak except as an appetizer or a shared table item, IMO. I will NOT go to David Burke's when I've got a hankering for quail and duck, but I could go to The Custom House, or Crofton on Wells, and maybe Naha (not always quail there) and other places I haven't been to before. If I want to go eat a great steak, and have a steakhouse experience, yeah, I'd be interetested to try David Burke's. I just can't stand the comparison. It's like apples and oranges to me. I think it just got confused because the chef has a Asian inspired seafood restaurant, and a vegetarian restaurant, and so he says he's opening a "meat focused" restaurant and that just means steak to some people. I've had two very nice meals at Custom House, and I've always found the service at all of the Shawn McClain Trilogy to be very well run. I am intrigued by David Burke's Primehouse, as I have been underwhelmed by everything I've tried in the BRGuest family of restaurants. farmerfood wrote: I've had two very nice meals at Custom House, and I've always found the service at all of the Shawn McClain Trilogy to be very well run. Please don't let my hearty endorsement of Primehouse be lost in a flurry of indignant posts having to do with Custom House. I happened to have a very poor meal there. I'm sure others really like the place. Comparing the two places is not the point of this post. I'm sorry if I gave that impression. It was just a literary device I used to make a connection between two visits I had to equally pre-hyped restaurants during their opening weeks. Nancy Sexton is right. Those two places are like apples and oranges in every way imaginable. I had the ribeye there on Sunday night. I thought the ribeye at Ruth's Chris was much better. I realize the ribeye is a fatty piece of meat, but this one had way too much. The first time it came out, it was overcooked. And the second time it came out, I felt like they had left off the salt and pepper. I'm not sure if this is just the way they cook their steaks so that you use some of their steak sauce? I had the caesar salad as well. And my table split the surf and turf dumplings. They were ok, but at a steakhouse, my steak better be great. And it wasn't. The room was very nice, and the service was adequate. But we didn't get the 20% off even though it says on their website that we should have. I didn't realize this until now as I didn't look at the bill very closely. Han wrote: I had the ribeye there on Sunday night. I thought the ribeye at Ruth's Chris was much better. I realize the ribeye is a fatty piece of meat, but this one had way too much. I've thoroughly enjoyed the bone-in rib-eye at Primehouse and, while it's just fine, have not found Ruth's Chris rib-eye in the same category. For one Primehouse dry-ages their beef, a step Ruth's Chris does not take. Two miscues at Primehouse, you do have a bit of bad luck. As an aside, though I have not compared them side by side it'd be my guess Primehouse's beef is more heavily marbled than Ruth's Chris, a good thing in my book. Is this what you are referring to when you mention fatty? Han wrote: The room was very nice, and the service was adequate. But we didn't get the 20% off even though it says on their website that we should have. I didn't realize this until now as I didn't look at the bill very closely. Sorry to state the obvious, but it's a good idea to check the bill no matter where you are. Not at Primehouse, but in the past I've caught mistakes ranging from minimal to hundreds of dollars. One well known restaurant in Los Angeles initially overcharged me $300 on the bill and, after correcting, charged the total to my credit card twice. I got it squared away, no problem, but it was annoying as hell. While I never ever completely understood Ruth's Chris, even the original in Baton Rouge (I feel like ten cents worth of melted butter is used to gild an otherwise solid but unspectacular lily), Han raises a point about ordering ribeye at prime steak houses. I know people love them, but for me -- who loves marrow and sweetbreads and chicharon and beef cheeks, etc. -- a high-prime ribeye borders on too much fat for a steak. My rule of thumb is the cheaper the steakhouse (many of the South American places, e.g.) the more you want the ribeye or the similar local cut. Not so much at the high-end places, where I consider a porterhouse to be the perfect two-course meal. Though I do enjoy the bone-in ribeye at Gibson's. The more steaks I have, the more I think that the old fashioned tradition of a muti-diner sized porterhouse is the way to go. For snacks in this area, there was... pretzels, which you could dip in a large bar of Neutrogena soap. Actually that's the legendary Himalayan salt with which the dry-aging cave is lined, and the pretzel rest in a curry oil, which was pungent and could clear out sinuses you never knew you had. G Wiv being a memorable sort of guy from last week's visit, David Burke himself and sommelier Eben Klemm both came by while we were at the bar and chatted us up, glad to see repeat customers. (It's too bad that the staff weren't giving us attitude for not being hip enough when that happened, but tragically, for such a cutting-edge place they were shockingly friendly.) Klemm is actually about to go back to his desk job for the company, but Burke told us he's committed to staying here for 6 months and really working the kinks out (not that there were many on display, except among some of the Beautiful People) before, presumably, the next Primehouses open in other places. Actually, if there's one place I think Primehouse is at a disadvantage relative to Smith & Wollensky and other spots, it's in terms of the overall atmosphere. S&W of course has the primo river location and the brand-new-building-that-feels-like-it's-been-there-80-years thing, which would be hard to duplicate, but the room's low ceiling, somewhat unsubtle lighting (you're either spotlit or plunged in darkness) and basic square shape with tables arranged in a simple grid doesn't have the variety of settings and table atmospherics that I think make a restaurant seem interesting and partly mysterious. (Maybe they should borrow Suhail for just one undulating wall.) And that night, instead of white tablecloths, they were using red leather table covers which, as the photo shows, were very attractive close up, but made the whole room look sort of like the hippest Western Sizzlin' you've ever been to. That, incidentally, is the big bread puffball with which dinner starts. It was gone in about 20 seconds. Another very good one was the crab cake, below, though I don't agree that it's the best crab cake I've ever had, simply because it's so unlike other crab cakes. But the whole pretzel-crust-crab thing is excellent. I really liked some big shrimp that came in a grapefruit sort of sauce as well; some dumplings on a stick, however, did less for me. Caesar's salad has been justly praised, so on to steak. I take it as my lot in life that I will always wish I'd ordered what someone else ordered, so even hedging my bet by ordering the porterhouse, with its portion of both filet and strip and its maximum bone exposure area, all of which was fine, I was more impressed by a bite I was kindly offered of Ms. Wiv's bone-in filet. Filet is not dry-aged as long as other meats (in fact it usually isn't at all) but that one bite had a perfect combination, for me, of tender texture, a little dry-age tang, and char-outside-fuschia-meat inside. (She actually ordered the surf and turf and I have to say the lobster was extremely well prepared, simple as could be but spot on, too.) In retrospect I realize that the porterhouse was too thin to get that char crust I really like without cooking the inside too far; the filet, with its Flintstonian hunk of bone hanging off the softball of meat, is the way to go. We also ordered every sauce they offered and came to some further conclusions. Most of the sauces and mousses were too much; I would not use the house steak sauces at all, and while G Wiv thought the red miso was disastrously overpowering, I thought if you used a tiny dab of it, particularly on the strip, it sharpened it up nicely. If you don't want to invest a small fortune in sauces, however, the choice is very simple. The truffle mousse or the truffle butter will dial up your steak on the lushness scale just a notch without wrestling your steak to the ground and making it cry uncle. Order one of those, use it sparingly, and you'll be very happy. Oh, and as noted, the Walla Walla wine mentioned above, unimpressive on its own, blossomed beautifully with the steak for whatever reason, a really terrific combination. I'd talk about sides, except they're still an afterthought (the tempura green beans were good, though, for the first few minutes they sat on the table), or desserts (the lollipop cheesecake thing is a really fun presentatation and is small enough to get over the fact that no one needs cheesecake, of all things, after a meal like this). But I don't have pictures and it'd be kind of a shame to spoil some of the surprise of the desserts. Anyway, Primehouse is an impressive place and there's some excellent advice in this thread about how to go and get the very best of it for your (by no means small) cash outlay here. If you're a steak kinda person, it's a serious contender. And so, lemming like, I went to Burke's Primehouse. I can add to the chorus of fans. Let's start at the beginning: the hostesses are as modelish as any in town -- yet, they lack the vapidity we have come to expect. Professional, intelligent greeters who do their job very well. The whole staff, from the suited captains to the hipster waiters to the guayaberrado backwaiters/busboys did a good job, though the opening hiccups are now starting to show. Our particular waiter was so new that he acknowledged miscues related to several "firsts" for him: first Manhattan (somewhat spilled); first oysters delivered table side (late). Indeed, cocktails and apps came way too slowly. But the kid was earnest and cool and honest and he comped my wine. So the glitches are showing up now, close to the weekend: the place was full. And they ran out of things by 8:30. Lobsters, for example. I heard "86" a lot. And the spare room, as others have said, borders on too simple. This is utilitarian design without the design part. The drinks were pretty good. 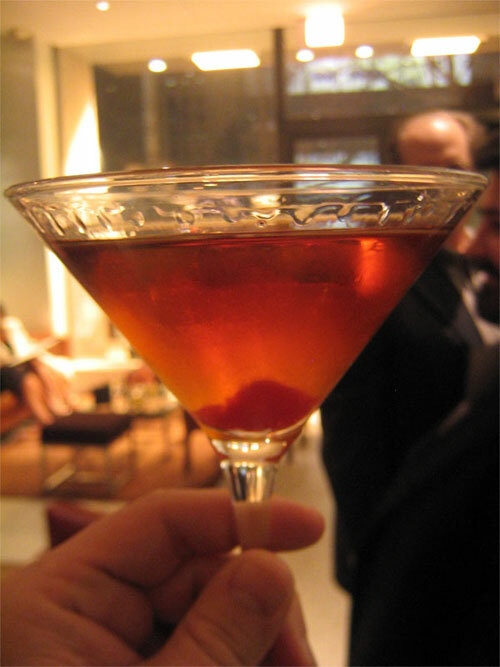 Like Mike, I would trade my deconreconstructed Manhattan for the original any day. But the mojito was an improvement with its sour topper of tight foam. Anyway, I'll cut to the chase: the sirloin is now my favorite steak in town. It's an ideal steak, really. Charred and meaty and gamy and taught, but also tender and mellow. Suave up front with a tough background. It's the Spencer Tracy of steaks. Also tried the bone-in filet. An excellent piece of meat, but nothing much different from what we're used to. Chorizo mashed potatoes are proof of something I never thought would happen -- the ubiquitousness of Iberian coolness. It's funny in the context of old Spanish restaurants in FL and NJ that look like pirate ship galleys, but I suppose no less shocking than the new Italian of the 80's and 90's. Chorizo and potatoes love each other, so of course it works. Caesar salad was what it is, which is great and rare today -- though I'd still like to see the back waiter macerate whole anchovies rather than spoon in paste, if only because I used to do the real thing a dozen times a night when I was a waiter. In the end, I liked it very much. Looking back over my post, it looks critical. But let me reiterate: great attitude, great sirloin. Yowsa is right. I can add to the chorus of appreciation. Drinks. I had the mojito, it was delicious, sweet and went down fast (or maybe that's me), but lacking the requisite foam. One of my dining companions, who is not, I repeat, NOT a cocktail person ordered the Manhattan with the leather-infused Maker's Mark. He loved it. Apps. The table ordered the Angry Lobster and the Shrimp Cocktail, all of which went over well, especially the Angry Lobster. Entrees. The table ordered two ribeyes, a porterhouse and the pork shank, and sampled each other's entrees. The porterhouse was delicious, although cooked above my recommended temperature. The ribeye was melt-in-your-mouth tender, and nobody had any issues with over-marbling of the meat as some have remarked above. Both steaks had a pronounced aged taste and the saline that is supposed to be derived from the himalayan salt - I guess I just tasted salt, but I couldn't discern whether it was from the aging process or from the kitchen. The real winner though, believe it or not, was the pork shank with the firecracker applesauce. The meat was huge, had a crispy skin (as advertised) and tender, flavorful meat on the inside. The applesauce was smooth and robust, coated your tongue, with just a hint of heat at the end. What a combo. Sides. I recall hearing here that there was some disappointment with the hash browns. So we ordered the creamed spinach (but received spinach and garlic) and onion rings. At $7, the portions were on the small side. The waiter was honest when he informed us up-front that the sides would really feed two people. That's correct. The spinach was spinach, a little too garlicky for me, but fine. I thought the onion rings were quite delicious although clearly overshadowed by the meat and seafood entrees. They paired well with the 207L sauce, which is the name of Burke's bull in Kentucky and which derives, sadly in my opinion, from the tag on his ear. Dessert. Even though we were stuffed and had take home bags, we ordered the doughnuts for the table. Fried, they were doughnut holes, Munchkin-like, and were accompanied by three sauces in squeeze bottles which you punched into the doughnut prior to squeezing out the sauce. Decadent, indulgent and fun, but like anything fried, it loses its luster after the temperature cools down. Service. The sales pitches were a little over the top. I personally don't enjoy sitting through a 15 minute dissertation of the menu when I can read perfectly fine, but that may be just me. Having said that, our server was a really personable guy who gave us a lot of attention. Wine. Extensive wine list; some interesting choices. We had a bottle of Crios Torrontes with the seafood courses, and a bottle of Korte Ranch Zinfandel, which paired excellently with the beef. Price. Expensive, but not out of bounds with other local steakhouses. I can't wait to go back. Just called to make a reservation for this Saturday the 22nd and the earliest I could get was 9:30pm. Looks like the word is out. My only hope is that the shortages have been worked out and that my late dining experience won't mean less menu choices. I'm a little nervous as this is supposed to be a celebratory dinner. IF there are menu items you know now you want to order, then why not ask them to reserve them for you? Good call, Cathy2. I will have to take a guess as to what my partner will be ordering as this dinner is a surprise, but still a good idea for any restaurant. Thanks for the tip. I'll go as far as to say that I do not remember a better steak than the bone-in KC strip (essentially, the New York strip w/ the bone) that I had tonight at DB's Primehouse. The flavor was simply fantastic. One of my friends ordered the Black Angus oxtail pot roast, served quail eggs, shallots, and mashed potatoes -- this dish will turn any pot roast hater into a pot roast lover . . . that good. But I will run back for the bone in KC strip because I have not had a better steak anywhere. But back to the beginning, they start you off with an interesting bread -- kind of a combination between bread and popover, with the bread part evident in the crust, but the popover evident in the middle. In any event, better than the usual bread served around town. For appetizers, we split an evening special which was three very large shrimp, each wrapped with basil and then enclosed in a phyllo-like dough and apparently pan fried, and served with grapefruit segments and a grapefruit-jalapeno sauce. Sounded very good, but the shrimp were quite overcooked and the jalapeno that I hoped would give the dish a bit of a kick was simply not noticeable. We also ordered the double baked potato as a side which was topped with corn kernels and bacon (thick cut and diced). But instead of the double baked being stuffed with potato, it was stuffed with a corn custard. The bacon and corn topping was very good, but the corn custard-type filling only ok. Overall, a decent side. The steak sauces served with the meal are decent . . . but the dry aged meat is too perfect to be spoiled by the sauces. One was made with horseradish and did not taste terribly more complex than a Heinz 57 w/ horseradish, while the other sauce had a smoky taste. We did order a side of the truffle mousse which was delicious, and at only $2, definitely worth ordering. It's basically cream whipped a little less than to soft peaks and infused perhaps with white truffle oil. Sadly, I could have eaten the entire serving just by itself. Dessert - the kickin donuts (i.e., donut holes) served w/ grape jelly, vanilla custard and chocolate cream. The donuts (enough for 2-3 people) were served hot and were delicious just by themselves. They're served with tiny squeeze bottles to insert the fillings which I liked quite a bit, although I would have preferred a darker chocolate cream. At $8, and considering we were not that hungry for dessert (and of course we didn't want to fall asleep at our next destination, Putnam County Spelling Bee), we chose to pass on the $15 cheesecake lollipops, which were hard to pass on after seeing them brought to another table (and although considerably more expensive than the donuts, it didn't look to be more substantial -- just prettier). Service was outstanding -- friendly, attentive and perfect timing. I'd highly recommend David Burke's Primehouse to any serious steak fan. At the very least, just be happy that Houston's, which used to occupy the space, is long gone. At the very least, just be happy that Houston's, which used to occupy the space, is long gone. I don't know anything about the new place, but I for one, am sad that Houston's is gone. I don't think there is a better high-middle end chain restaurant out there in terms of menu, execution, service and atmosphere/decor, and it is surprising to me that they did not "make it" in the Chicago area. ^agreed. Plus their french dip was one of my favorite sandwiches in the city. I don't for any second see how there were this many good reviews for DB's Primehouse. I'll start with when you walk in the door. As a guy, I was pleasantly greeted by what looked like could have been 2 models at the host stand. They were appropriate in that they seemed an important function of the restaurant and that they were arranging your seating, not just there as "chic" dressing for a new hot spot. Arriving early to meet my other four dinner guests I went to the bar area.......this alone could keep me from returning. The bar is almost unfunctionally small and is so sterile that it makes a W bar look like a country cottage. If you aren't one of 8 people they have seating for, you stand in what is essentially the lobby. Now I know they have a bar/club/lounge, but this was not open 4/20 at 7.30pm. Having been to the Scottsdale location, I expected a bit more. The dining room I think would be described as schizophrenic. It seemed a kaleidascope of Nine, a W setting, and Gibsons. It tried to be minimal, trendy, chic, and still have something that made you think steakhouse with the leather.For me it didn't work. They should lose the popover idea. Either ours were burned or they just don't taste very good. The apps were excellent, though we didn't have any dessert, this was by far the best part of the menu. Angry lobster, shrimp cocktail, and the crab cakes were excellent. The crab cakes were very unique and I thought extremely good. Between the 5 of us I had the surf and turf with the bone in filet, 2 ribeyes, and I believe 2 had the KC sirloin. I consider myself a steak connoisseur, but these were NOT dry aged steaks. Maybe they were busier than originally planned and ran out, but these were not dry aged prime steaks. The meat was not "broken" down the way a typical dry aged steak is. It lacked that flavor, texture, and the way a good dry aged steak almost melts in your mouth. The lobster was good. I would echo the comments of their sides. The garlic and salt from the creamed spinach was overpowering and the hashbrowns were nothing special. Those were the only two I tried. I think something was very wrong the day we were there because I noticed only awful reviews on metromix(I'm sure that is frowned on here) for April 20th and the days around it. Primehouse is at best a good place for seafood and a mediocre steakhouse. Primehouse would not rank in my top 10-15 places to get a steak in the city. For the money and value it would not rank in the top 100. Not one person in our group said they would ever go back. It wasn't bad, it just wasn't very good. I would be much happier at Select Cut. chicagoeater wrote: Between the 5 of us I had the surf and turf with the bone in filet, 2 ribeyes, and I believe 2 had the KC sirloin. I consider myself a steak connoisseur, but these were NOT dry aged steaks. Maybe they were busier than originally planned and ran out, but these were not dry aged prime steaks. Last edited by BR on July 14th, 2006, 4:52 am, edited 1 time in total. While my impression of DB was not quite as negative as chicagoeater's, I have to say I was disappointed with my meal there last Saturday. ~Mr.Paris & I arrived on time for our reservations, and were promptly seated. I was surprised that the restaurant only seemed about 2/3 full - for a "hot" place on a Saturday evening, that struck me as odd. The drinks were great - really one of the highlights of the meal. We opted for the cocktails - he got a "highball" with plymouth gin, apple juice, sage, and cranberry, I got the mojito. Both were perfectly mixed, really great drinks. We opted out of the wine list - I was annoyed to see that the markup fell into my definition of "ridiculously high" - it was at least 3x retail (I believe the industry standard is around 2x retail). Anyway, we were happy with the drinks, even if mixed drinks aren't the ideal accompaniment to a meal like this. After reading all of the gushing reviews on this board, we had high expectations,a nd a good idea already of what we wanted to order. We ordered the Angry Lobster and the Caesar Salad to start, and wanted to order the South Side Filet and the Pork Shank for mains - except that on a Saturday night at 8:00, they were out of pork. I had really been anxious to try that, and was disappointed (and peeved with the lack of foresight on the part of the kitchen). We ordered the grilled mushrooms and tempura onion rings on the side. Angry Lobster - I thought it was good, Mr.Paris was somewhat disappointed. There was a good amount of meat for a 1-lb lobster, and I liked the spiciness (though wondered if that detracted somewhat from the lobster's delicate flavor). Caesar Salad - We would have liked the tableside preparation a lot more if the person preparing it had been responsive - or if we could have seen what was going on better (the lighting was very dim). When Mr. Paris asked specific questions, we only got silence in return... everything was prepared without a single word, the salad plated, and we were left alone again, not quite getting the point of the tableside preparation. The salad was good, though. South Side Filet/med-rare - Easily the best dish of the night. Melted like butter in the mouth, exquisite flavor. We'd go back for this alone. Kentucky Rib-Eye/med-rare - Very good, just not as much to our taste as the South Side Filet. Personal preference. Sauces: this is the first high end steak place that I've been to that actually seems to encourage people to use sauce. They provide 2 complimentary sauces, the Classic and the 207L. I wasn't a big fan of either, but I particularly didn't like the Classic - it tasted like cocktail sauce, lots of horseradish, ketchup-y taste - I didn't think it went well with the meat at all. The 207L was closer to the A-1 style, pretty sure I detected worcestershire sauce... it was better than the Classic, but I still preferred my steak plain. Sides: the sides, as people have noted here, were disappointing. The mushrooms smelled great - and tasted pretty good too, except that they were absolutely drenched in butter, to the point where they were practically inedible. The tempura onion rings were fine, nothing too special, but at least inoffensive. Dessert: we split the banana sundae. It was good - fried bananas, banana bread, three scoops of ice cream (banana, vanilla & blueberry, if memory serves me), and chocolate sauce. It wasn't transcendant, but it was a perfectly good dessert. Throughout the dinner, the service was perfunctory, but never more than that. I think that warmer service could have made up for some of the meal's missteps, but with service that was no more or less than "fine" we left disappointed. My meal at DB's wasn't so bad that I'd never eat there again - I'd go back for the steak in a second (and I still want to try that pork shank!) - but overall I just felt...let down. It definitely sounds like DB's has had some mis-steps. Sides are drawing complaints across the board and a number of service glitches have been noted. I hope they get their act together because the steak I had was as good as it gets, and there are not so many option in Chicago for dry aged beef --Chicago is definitely a "wet aged" town. But without question, it's a competitive steakhouse city and they better resolve the gaffes soon. But of course, Shula's is still open somehow so who knows. I understand that it is quite a statement to essentially accuse a restaurant of not delivering that which they advertise. I know the flavor differences of a dry aged steak. Even if my filet that came with the surf and turf was not advertised as dry aged, I tried both the strip and ribeye and they were simply not dry aged steaks. As many of you know it takes about 10-28 days to dry age steaks. They claim to dry age their own steaks from their own bull in Kentucky I believe. I think they simply got too busy and had to use their steaks that had not had time to dry age. I don't think they were being deceptive, just desperate. 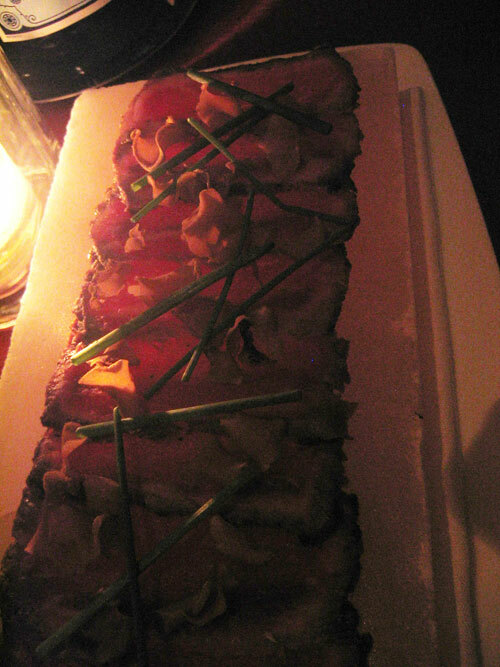 BR wrote: there are not so many option in Chicago for dry aged beef --Chicago is definitely a "wet aged" town. Marina City, 318 N. State St.
That's a nice list that you've put together -- more than I expected, although I still wish more of the major steakhouses (Gibson's and Keefer's, for example) offered dry aged beef. I just prefer the flavor. I read an article recently where one of the steakhouse owners was quoted as saying he thought Chicagoans preferred wet aged beef, and that a couple of local restaurants switched from dry to wet. Of course, wet aging is less expensive than dry aging. Jury's is the most interesting of those mentioned -- I'm just surprised that they'd bother. But that might give me a reason to try something other than their burgers. I understand from the article in the Tribune Wednesday that Harry Caray's is now serving Tallgrass beef, but I don't know that they're still dry aging beef. In any event, I'm eager to try the Tallgrass beef (I tried a sample of the burger at Fox & Obel and thought it was excellent).